350 Multifunction video inspection has been designed as a user friendly and economical way of solving hidden problems and increasing productivity. (e.g. inspect vent pipes, air conditioner system, equipments, engines etc.). The product has a high clarity color 3.5″LCD. 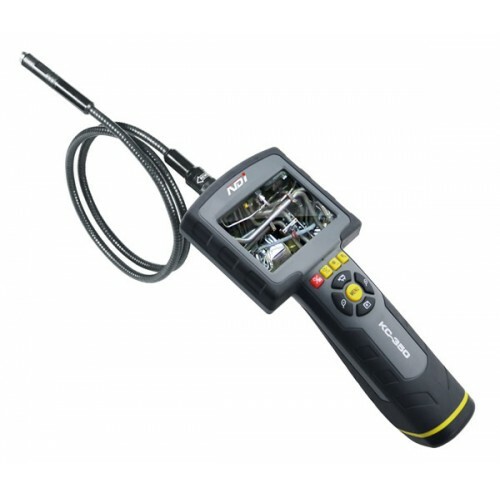 It uses interchangeable probes and can be connected to probes with different length and diameter (product comes with a standard 12mm probe, customized camera head and probes are also available). The camera head is with adjustable LED lights, which helps you to inspect gaps and holes. The camera head can equip with several accessories(magnet, mirror, hook etc. ), making it more flexible. 350 has an internal memory (support Micro SD), and is capable to capture videos, take photos manually or automatically. It has a built-in microphone and a speaker, which makes it possible to record and playback sound. The product has a TV output and a USB port, which allows the users to connect the unit to a TV or a computer. The product also supports image zooming and rotation. It has the advantages of small size, clear image, stable performance, easy operation and portability. It is widely used in applications such as the industry, the building, the aviation, the vehicles maintenance.